Busy lives have a direct correlation to the number of times a packet of Maggi is ripped open for dinner. Unfortunately as I’ve grown older and more conscientious of what goes into my system, the packet of Maggi doesn’t fit into the scheme of things (often at least: P). But a hungry tummy needs to be fed, and though going out for dinner or ordering in seems the most logical option – we can now add one more avenue into the mix. Recipe Kits with a complete set of ingredients and minimal prep and cooking time to rustle up World cuisine at home! 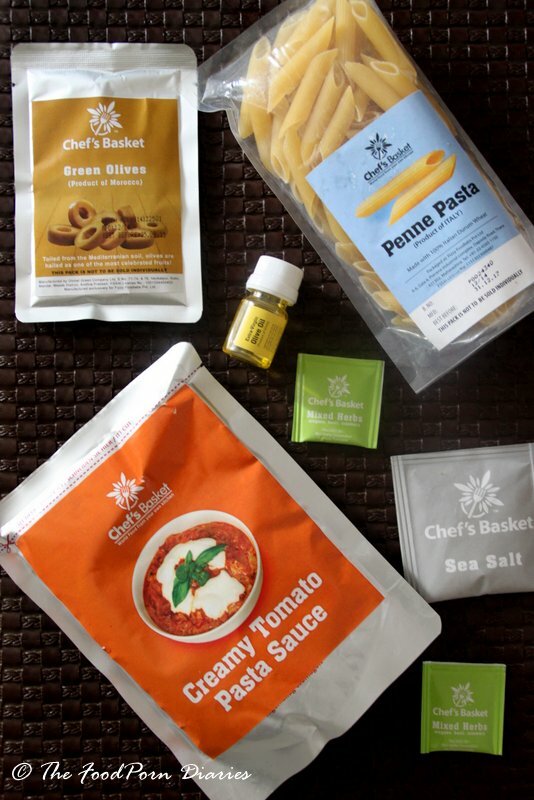 Chef’s Basket sent me two of their recipe kits and I put it to the test last week. The premise is simple. The kit contains everything you need to rustle up a meal for 2-3 people. All you need to do is slit open the pre-portioned packages and put it all together. It’s going to take 15 mins of your time hovering around in the kitchen…but you probably spend that much time, just going through your pantry deciding what to make on a normal day! 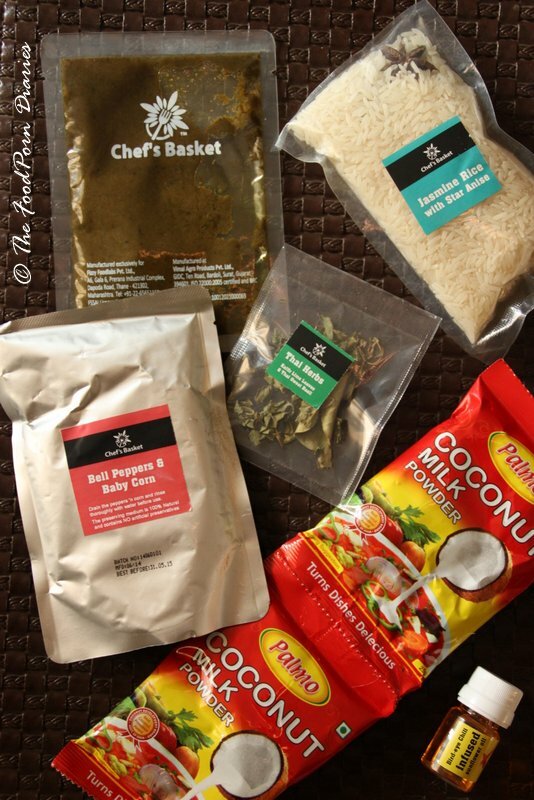 The Recipe Kit is a complete set of premium and authentic ingredients, to prepare dishes from across the globe. The ingredients are handpicked from their origins including Italy, Spain and Morocco and Mexico for an authentic culinary experience and an impeccable taste. Every product is 100% Natural and has NO artificial colors, preservatives or flavors. Tossing pasta in a sauce for their Penne in Creamy Tomato sauce, though inviting, didn’t seem as challenging as preparing a Thai Green Curry with Jasmine Rice. I even choose a busy weeknight to truly test its mettle. The first thing you notice is their innovative packaging – The kit itself looks like a mini picnic basket and the attractive pictures of the final dish get you hungry with anticipation. Apart from standard nutritional information, cooking time and how many people it serves – the kit also pictorially shows you what’s inside. Take care to open the kit, as you will need the recipe printed on it, to churn out dinner! I laid out the contents on the table – Green Curry Paste, Jasmine rice with a pod of star anise, 2 packets of Coconut Cream, diced Bell Peppers and Baby Corn, Thai Herbs and Bird-Eye Chili infused Sunflower Oil. Pretty much everything you would source yourself – if you wanted to make the curry. I decided to make a shrimp version of the Thai curry and also laid out 200 gms of medium sized cleaned and deveined shrimp. I set the timer to zero and started on my quest to churn out a restaurant quality Thai dinner in 15 mins! I put another pan on the fire, and poured in the chili oil. After quickly rinsing the diced bell peppers and baby corn I sautéed them in the oil along with the kaffir lime and basil leaves. I added the Thai curry paste and let it sizzle in the pan. (The cooker blew a loud whistle here – and the recipe suggested turning of the stove and letting the rice sit in the cooker to let the steam complete the cooking). As I had decided to use shrimp – I tossed in the shrimp at this point. Meanwhile, I heated 2 cups of water and slowly put in the coconut cream powder. I added this to the curry paste. After letting the curry boil for 5 mins, you add in any additional fresh herbs and voila – the curry is done! I quickly glanced at the clock – it was 24 mins. Now now, I’m not going to be such a stickler – I had after all introduced the “add shrimp” step to the recipe. But you must admit, 24 mins for a complete meal (that’s not instant noodles) is still a fabulous accomplishment! I opened the cooker to the delicious aroma of jasmine rice and star anise. And the rice itself was perfectly cooked – distinct grains but still soft to the touch. The curry had me salivating even as the curry paste was cooking down, so the final aromas with the herbs was all the more enticing. We sat down to enjoy our quick meal – leisurely. The Penne with Creamy Tomato Sauce had its day in the sun on a Saturday afternoon. 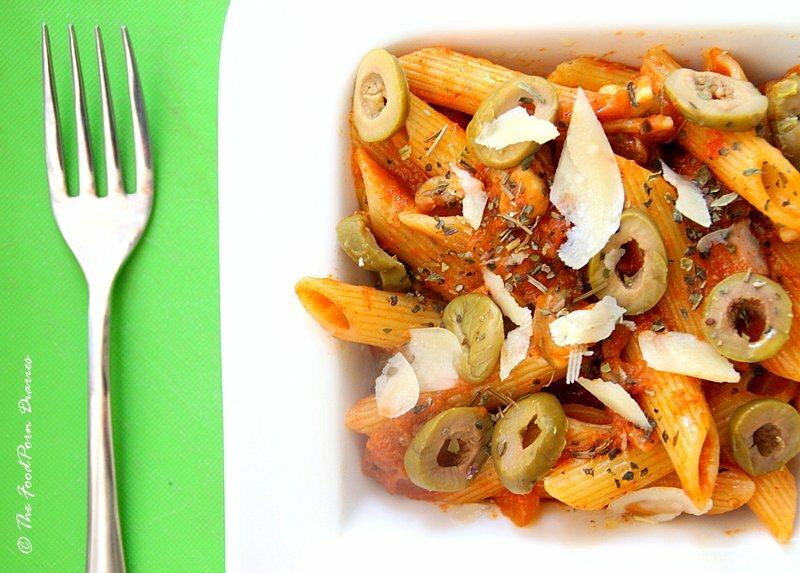 The ingredient list was fairly simple – Penne Pasta, Creamy Tomato Pasta sauce, Green Moroccon Olives, EVOO, Mixed herbs and Sea Salt. The instructions were simple – again, two stoves help. 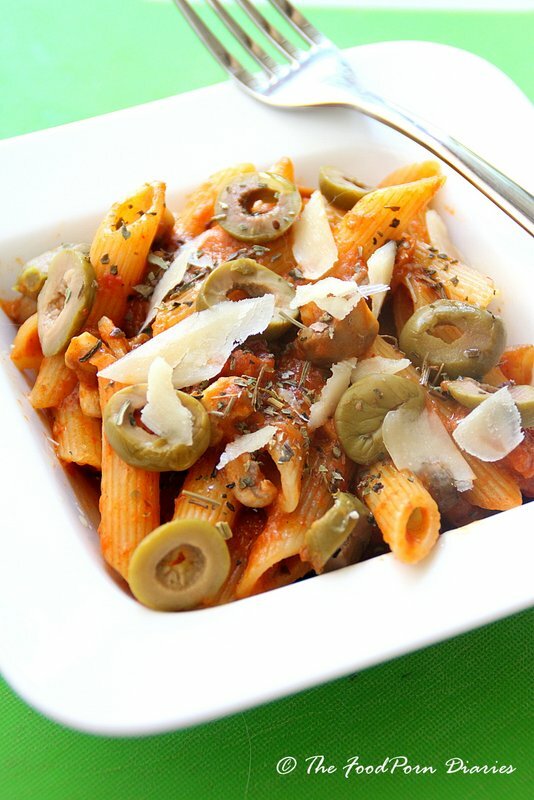 Boil pasta, heat sauce, add olives and herbs and finally toss pasta in. The only thing I added in was 200 gms of sliced sautéed button mushrooms to the mix and dressed it up with some shaved parmesan and my pasta was ready! Taste: 8/10 – Comparable to a meal prepared painstakingly at home. 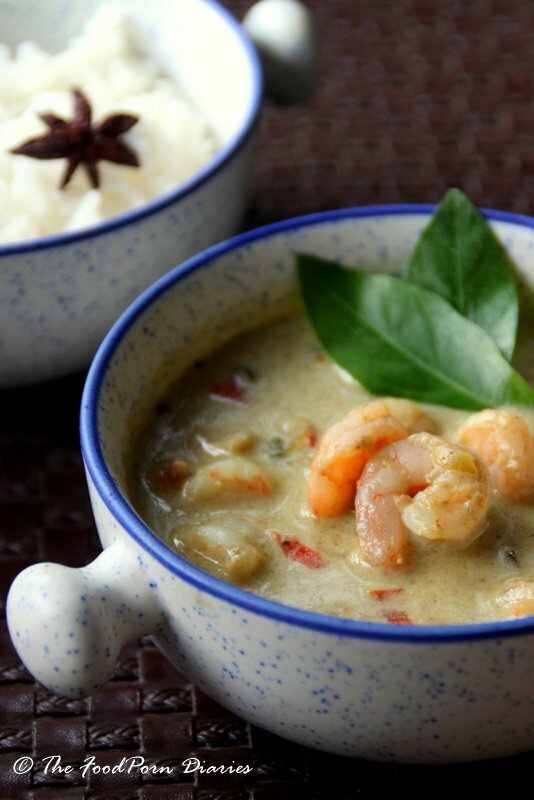 The Thai curry was silky, coconutty and pungent. The jasmine rice was on the dot and the addition of star anise definitely bought it some character. The Penne with Creamy Tomato Sauce was delightful. Just the right consistency and rich tomato taste. Convenience: 10/10 everything comes in a kit. How much more convenient can it get? Portions: 7/10 Even for moderate eaters – it’s still a two person meal and not 2-3 as advertised on the pack. The curry would have easily been sufficient for three people, but as a rice-eating-South-Indian, I could have been happier with a little more rice. The sauce for the pasta was more than sufficient for three, the pasta itself was sufficient only for two. Also, I felt the addition of shrimp / mushrooms (or additional protein) is what made the meal substantial and filling. I doubt I would have been a happy camper without it. Price: 8/10 Both the kits I tried, were priced at Rs. 300/-. This is definitely cheaper than a restaurant meal on its own. But if you want to make the meal rock, and you decided to add in other protein – it does increase the cost of the total meal. Overall Experience: 8/10 A tasty, easy and fun way to bring world flavours to your dinner table. It lets you experiment with different cuisines at home, without breaking the bank or having an overload of ingredients in the pantry that you use rarely. And finally – the recipes and steps are so simple that even a novice in the kitchen will feel confident churning out a restaurant quality meal. That’s a compliment … and a motivator in itself!